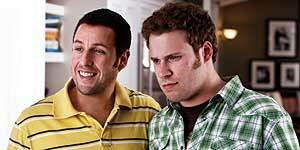 This is an enjoyable, frequently funny comedy-drama with terrific performances from Sandler and Rogen, but it's also way too long and the first half is much stronger than the second. Written and directed by comedy guru Judd Apatow, Funny People stars Adam Sandler as George Simmons, a stand-up comedian turned A-list comedy star, who's diagnosed with a potentially life-threatening illness and suddenly discovers he doesn't have any real friends he can turn to. After catching some of his act, George decides to take struggling comedian Ira (Seth Rogen) under his wing, hiring him as an all-purpose confidant, personal assistant, joke writer and general dogsbody. George's late night heart-to-hearts with Ira make him realise that he's only ever loved one woman (Apatow's wife Leslie Mann as Laura) and when his illness miraculously disappears, he’s determined to get her back. However, when he attempts to reconnect with her, he discovers that she's married to brash Australian businessman Clarke (Eric Bana), with whom she has two adorable kids (Iris and Maude Apatow). Sandler is terrific, in a cleverly written performance that both draws from and pokes fun at his own life, including clips from Sandler's own home movies and early stand-up, as well as some hilarious spoof movies such as My Best Friend's A Robot (with Owen Wilson), Mer-man and a film where he plays a man-baby. Rogen is equally good and there's strong comic support from both Jonah Hill and Jason Schwartzman as Ira's more successful best friends. The script is excellent, managing to cover deeply personal themes and concerns while also serving as a fascinating portrait of the life of a comedian. As a result, it's frequently hilarious and is packed with quotable dialogue. That said, the second half of the film is less successful, partly because of a lack of chemistry between Mann and Sandler and also because of poor pacing and a ridiculously over-indulgent running time. In addition, the film is occasionally just a little too pleased with itself and the endless parade of celebrity cameos begins to grate after a while. Funny People is a superbly acted, frequently hilarious and occasionally moving comedy drama, but the second half is disappointing and the lengthy running time and general self-indulgence may prove off-putting for some.